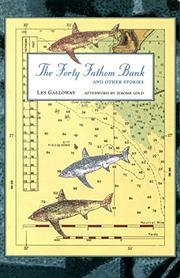  A shark fisherman's greed and paranoia foul his get-rich-quick scheme in this tidy novella (self-published in 1984). In 1940, the unnamed 29-year-old narrator buys a small boat, hoping to keep his wife and children out of poverty by leading fishing expeditions. Then the Nazis cut off Scandinavian fish exports, a major source of vitamin A; at the same time it is discovered that shark livers contain staggering levels of the expensive and rare vitamin. High demand for sharks drives prices through the roof and creates prospecting opportunities in San Francisco's fertile waters comparable to those of the Gold Rush. The nervous narrator, an unskilled fisherman, avoids going out for sharks until the last weekend of the season. Then he hires ``weird and honest'' Ethan May, an expert shark hunter, who leads him to fish at the 40 fathom bank (where sharks usually feed) after they agree that the narrator will keep the first three tons of shark they catch and May will take the rest, which could be 20 tons or more. The silent loneliness of the sea (May is not a conversationalist) and the interminable waiting involved in catching sharks gives the narrator too much time to let his expansive imagination wreak havoc. In between vivid descriptions of life at sea and the shark-hunting process, he indulges in reminiscences of his childhood, dreams, and concerns about his family. This, combined with his tendency toward Poe-esque paranoia, leads him to the unfounded conclusion that May is a malicious money-grubber. He projects his manic, vacillating temperament onto the hunter's quiet, unflappable one until May appears as an epic monster in his avaricious eyes--a determination that leads to the tale's violent, inevitable denouement. A pithy one-hour read for literary fishing enthusiasts.